Those who hate and inflict death, destruction and grief do not make victims who cower in the darkness, instead they create giants who stand in the Light. Certain days are painful reminders of the loss of a loved one. September 11 is a day which symbolizes loss and grief on a mass scale, and yet brings it home to all of us on a personal level. Today Is Not That Day is an affirmation designed to help those suffering from the loss of a loved one. Affirmations are positive statements said to yourself to help uplift you from a negative to a more positive state of mind. Since posting the blog Today Is Not That Day, I’ve been overwhelmed by requests for more affirmations to help cope with the passing of a loved one. I was at a loss for what to say or do. The answer came to me during my recent Never Letting Go book signing tour of New York City where I was honored to visit the 9-11 Memorial. 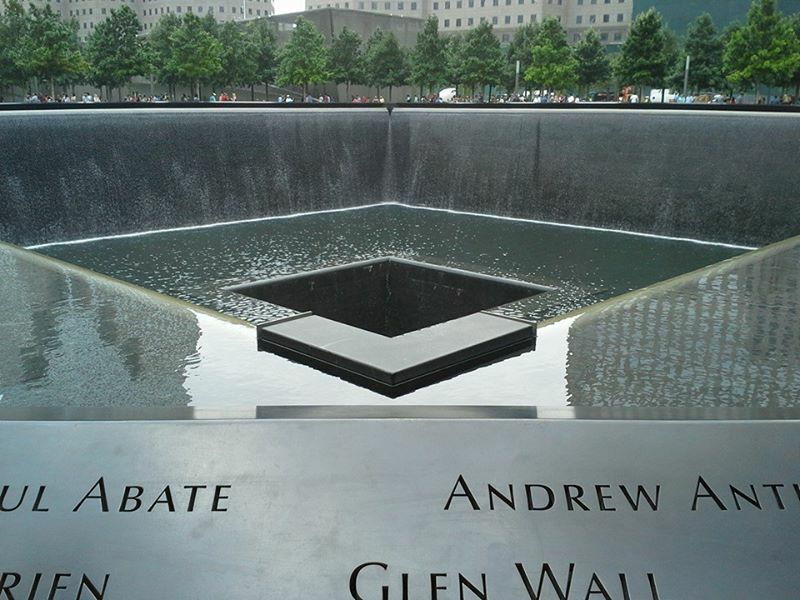 Watching the somber yet elegant memorial with its immense waterfalls flowing into the void was serene, yet I felt another emotion surge through me–anger. I was angry that such enormous pain was inflicted by cruel hateful fanatics upon so many innocent people—I felt powerless—and then it dawned on me—that’s the key to healing from the past—realizing I was powerless to change it. How many times do you feel anchored to the chains of the past? Does your mind replay a traumatic event over and over to the point you feel no escape from the pain? Do you find yourself looking to someone else for approval or validation? You may not even realize how much the past has a grip over your feelings in the present and your view of tomorrow. Do you focus on events in your past which you feel “robbed” you of your validation, self-esteem or even happiness? Were you treated rudely or cruelly by someone? Maybe it was a family member, friend, classmate, co-worker, boss or stranger. These negative emotions and experiences are intensified when linked to the death of a loved one. How many times have you wished you could go back in time and save someone’s life? Given the opportunity everyone would go back in time to save the life of a loved one. With the ability to time travel you could change something about your childhood, career or relationship. You may even want to bring last Saturday night’s winning lottery numbers. As long as you’re swinging in to save the day you might as well become a millionaire—right? Sounds great! But unless your eccentric genius neighbor Dr. Brown invites you to go for a spin in his DeLorean with its newly upgraded flux capacitor, it’s impossible to change the past. On a serious note, people tend to feel responsibility for the terrible things which have happened to them whether or not they were at fault. This self-imposed burden of responsibility triggers anger, resentment, guilt, and depression which results in low self-esteem. Realizing how powerless you are can empower your emotional healing. When the darkness of negativity overwhelms you as your mind replays the death of a loved one, or some other trauma from your past, look to the Light of powerlessness. Accepting you are powerless to change the past or control the behavior of those who’ve wronged you in the past lifts the weight of responsibility from your heart. This leads to accepting you are the only one responsible for your actions and feelings. It also helps you understand while you cannot change the past, you must learn from it in order to grow personally. By accepting you have no power to change the past you are now empowered to control the present. The road to healing is not an express lane but rather a long and winding road through many peaks, valleys, and detours, but ultimately you’re the one in the driver’s seat. You may be powerless over yesterday but you are empowered today for creating a better tomorrow.